A good friend sent me this image and notes last night, and I have to say I now view Frida Kahlo's work in a new light. I've seen the painting. I've seen Selma Hayek's movie Frida. This portrait well portrays the anguish and pain. The great Mexican painter Frida Kahlo suffered chronic widespread pain and exhaustion after a terrible accident. Our research suggests that FM was the cause of Frida's chronic illness. 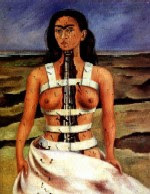 Many of Frida's portraits, for example in Kahlo Columna Rota (The Broken Column) communicate pain and anguish with the emotional overtones that FM patients frequently use to describe their illness. In her diary, Frida draws herself in pain and eleven arrows point to specific anatomical sites. Many years later, the majority of these sites were found to be the typical fibromyalgia tender points. In my own research, and as I remember from the film, Frida Kahlo was in a car accident in late adult hood. Car accidents are a documented cause for the onset of FM. Thank you for sharing, I would love to share a link to your blog and this post, on my blog. I suffer FM and it's awful. It's no wonder I truly relate to Frida so much! !